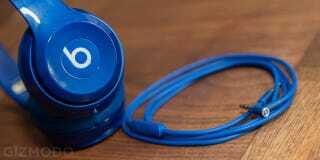 It's been hours—hours!—since Apple and Beats announced they would be tying the financial knot, and today, we're getting a revamped version of Beats' most popular headphone. The Solo was a winner, and so the new Solo2 doesn't mess with the recipe much. The Solo2 sport an identical foldable, on-ear design to the older model. The cans clamp hard on your ears compared to other on-ears, but the angled cups do a decent job of distributing some of that force so they don't pinch. They've got that same plastic design with the iconic "b" slapped on the side. As a far as I can tell, the main difference between the new model and the older one is that their tuning has supposedly been redesigned to address the widely criticized bass-heavy sound profile of Beats products in general. While I don't have a pair of the older model handy, I can compare the Solo2s to my well-broken-in Sennheiser Momentums and the Solo2s definitely still slant towards very powerful bass, though, not to the point of completely obfuscating mids and highs. These cans are still way better suited to blasting hip hop than to, say, 90's alternative where you'd want a little more clarity. I haven't had the chance to fully evaluate the Solo2s, but I can say for sure that Sennheiser Momentum on-ears and V-Moda's XS headphones are more comfortable, better built, and produce more accurate sound. All three headphones cost $200 a piece.